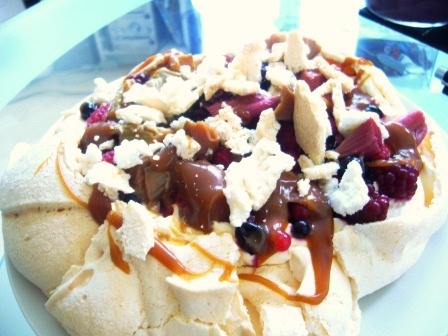 I’ve always admired pavlovas as a pudding, they look gorgeous, huge billowy meringues, topped with lashings of cream and fruit, but have always been scared of making meringue myself. However, having been inspired by the brilliant Supper Club by Kerstin Rodgers’ and been asked to bring a pudding to a friends barbecue I decided to have a go. I will confess now I didn’t make the meringue from scratch I used a packet of Pavlova Magic that had been kicking around in our cupboards for ages. In hindsight next time I will just make pavlova from scratch, given the time it takes to whisk everything together I wasn’t convinced it saved that much time or that the results were that much better (not that it was bad). 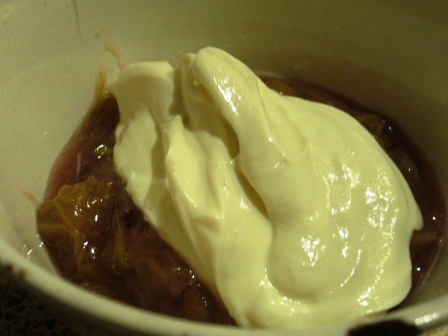 I started cooking quite late so left the meringue to cool in the oven over night and topped it the following day with a carton of double cream whipped until firm and topped with mixed berries, our own stewed rhubarb, and Sea Salted Caramel from Supper Club. It went down really well, but pavlova usually looks beautiful, and it tasted pretty good too. There was a bit too much soft meringue in the middle for my taste, but that doesn’t mean I had any problem eating a lot of it. Next time though I promise I will fight my fear and actually make one from scratch! Honest. 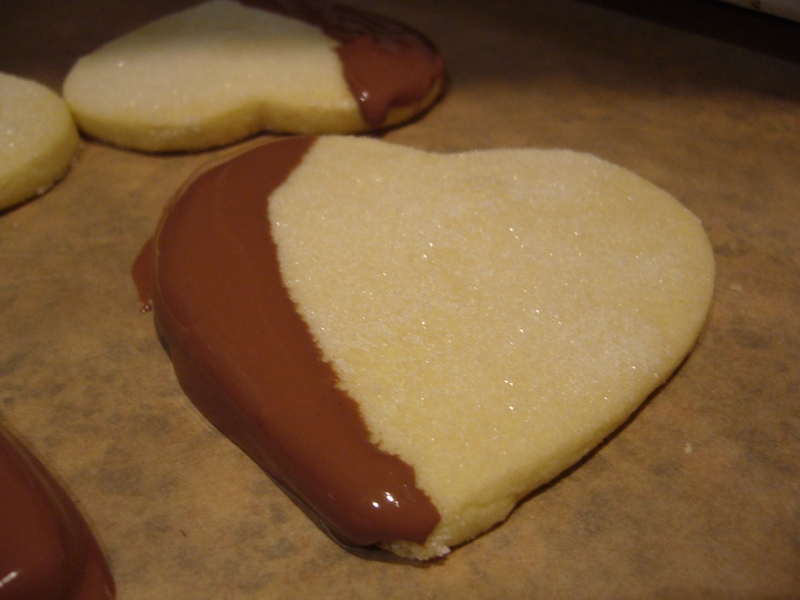 I decided to make some valentine’s biscuits for The Man, and some to snaffle myself. It was a first time attempt at shortbread for me, but I used the most simple recipe I could find and crossed my fingers. 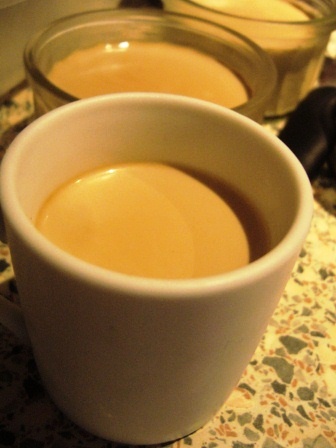 – Cream together the butter and sugar in a bowl then gradually mix in the flour. – Using your hands knead the flour into a smooth dough. – Roll out to approx 1/2 cm, cut out shapes and place on baking tray. – Bake at 160c for 10-15 min (or longer depending on your oven) and sprinkle with extra caster sugar as they cool. I also dipped them in chocolate, just because really! The texture of the shortbread was pretty much spot on, a little sandy and crumbly but still holding together nicely. I think our oven runs a little cold so next time I’ll cook them for a bit longer for extra crumble but overall it seems a pretty sound recipe and certainly wasn’t as tricky to make as I had thought. 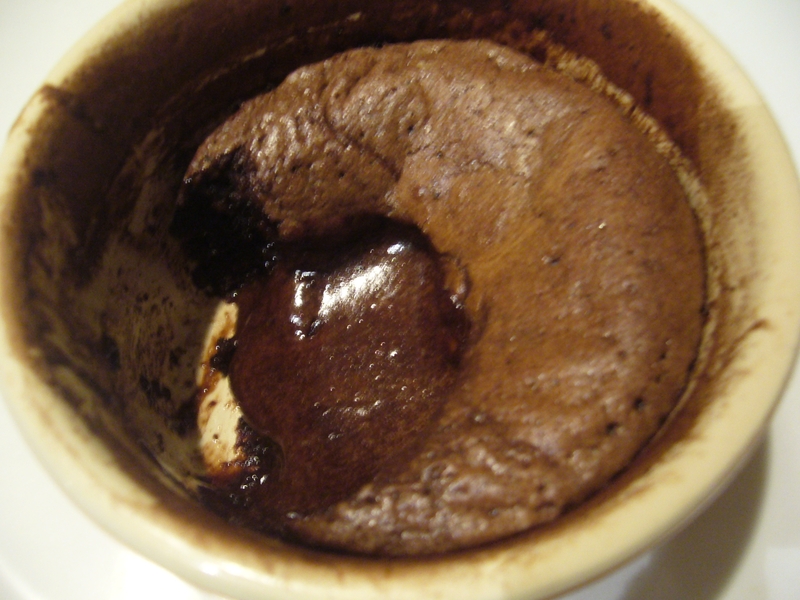 As The Man will be in Norway on actual Valentine’s Day we celebrated a bit early, and I had a go at making my favorite restaurant desert Chocolate Fondant. It was a bit of a high risk strategy having never cooked them before as timing is crucial to avoid the puddings being cooked all the way through and missing out on the gorgeous melting middle. Ta da! It worked, although I was too afraid to turn them out on to a plate. Actually the timing was the only difficult tricky thing about making them, and they were really really good! I used another Guardian recipe, but substituted plain chocolate for one flavoured with orange and geranium. Chilling the mixture before cooking, means they take a few minutes longer which made me feel a little more in control of things. 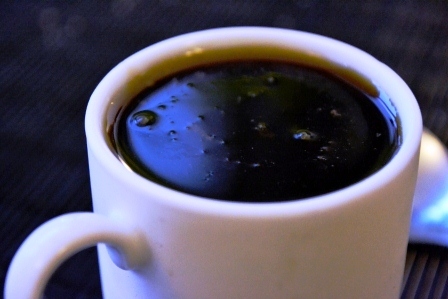 The recipe was straight forward, easy to follow and definitely lived up to my expectations. Next time I’ll be braver and try turning them out! I loved jelly as a kid, it was party food so it stood for all that is great about kid’s parties, silly games, far too many e numbers and a whole host of food you wouldn’t normally eat in one go! However, jelly isn’t something I’ve tended to eat since I was about 12! 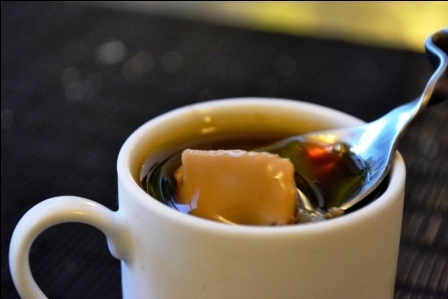 That is until The Man bought a copy of Jelly with Bompas and Parr , self-styled jellymongers as well as creating food experiences like a scratch and sniff cinema they have also championed jelly as a grown up, sophisticated and sometimes down right naughty food stuff. The book is full of gorgeous photos of their creations a variety of recipes from the straight forward to the highly complex, with some great advice on the technical side of jelly making. It has been sitting on the shelf for a while and yesterday I had my first play with one of the recipes! 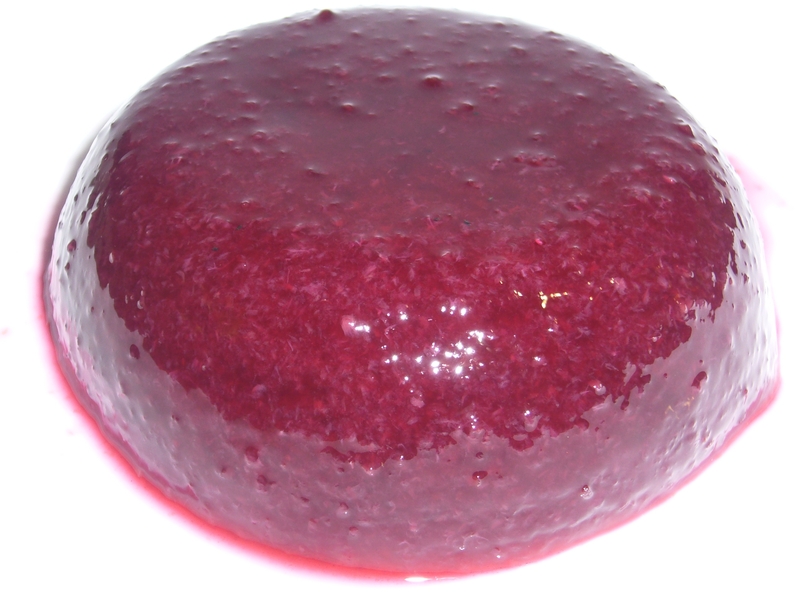 The result, a cherry and sloe gin jelly. I used the cherry jelly recipe as a base but where it recommended a glass of Kirsch I used Sloe Gin. I have to say the process was as easy as the book had assured, the only issue was that there was still a lot of pulp in the finished jelly, rather than being smooth and clear as shown in the book. I sieved it twice, but perhaps too enthusiastically or maybe I need a finer sieve. Despite the aesthetic issue it was an incredible jelly, packed full of flavour and with a satisfying wobble and just fun to look at and at eat. Definitely not one for a kiddies party, but I’ll definitely be trying other recipes. It may not be a serious food stuff but it’s fun and sometimes that’s what I want.